After three months of negotiations, Tajikistan and Kyrgyzstan have reached an agreement on price for Tajik electricity flowing into Kyrgyzstan this summer, 24.kg reports. This is not the first time Kyrgyzstan has found itself in a tight spot with regard to energy. In 2014, Uzbekistan cut gas supplies to Kyrgyzstan for eight months. As Eurasianet reported last August, the gas shortage pushed southerners toward coal and electricity. But the electric grid in Kyrgyzstan is fueled primarily in the summer by hydropower and last summer the reservoirs were low. This summer, Azernews reports, the Toktogul reservoir is low again. It is no surprise that there is ongoing and widespread criticism of the Central Asia South Asia Electricity Transmission and Trade Project (CASA-1000), extolled by the region’s leaders, development organizations and the United States, as the solution to the broader Central and South Asian region’s energy woes. 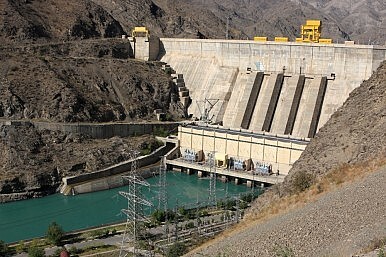 CASA-1000, financed in part by the World Bank, aims to establish electricity trade from Tajikistan and Kyrgyzstan to Afghanistan and Pakistan. An accord settled in December between the four was lauded as “historic” by Pakistani officials. In late May after meeting with his Kyrgyz counterpart, Pakistani Prime Minister Nawaz Sharif said the project “would ease the electro-energy deficit” in Pakistan. Somehow, this basic fact – that Kyrgyzstan and Tajikistan have scant supply sufficient for domestic populations, let alone to export en masse – has slipped the affiliated governments, both regional and America. It is the hope of both Tajikistan and Kyrgyzstan to increase their electricity production to such a level as to make CASA-1000 possible. But it is a decidedly uphill battle, complicated by the challenges of climate change and the whims of weather (a mild winter means lower summer reservoir levels), the unreliable status of security in Afghanistan and an awful lot of infrastructure construction. Additionally, political good will across the region is necessary and not to be taken for granted. Is Kyrgyzstan energy independent at last? Not quite.